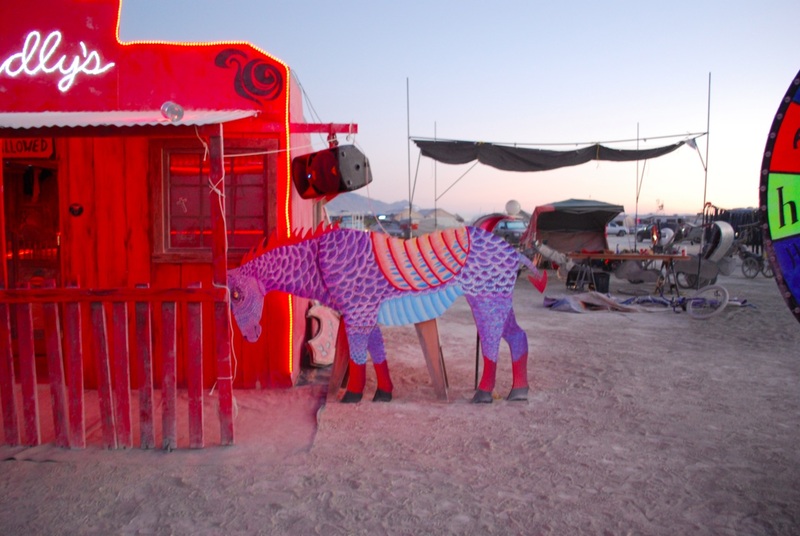 For Burning Man 2013, our camp's benevolent dictator asked me to build a horse. 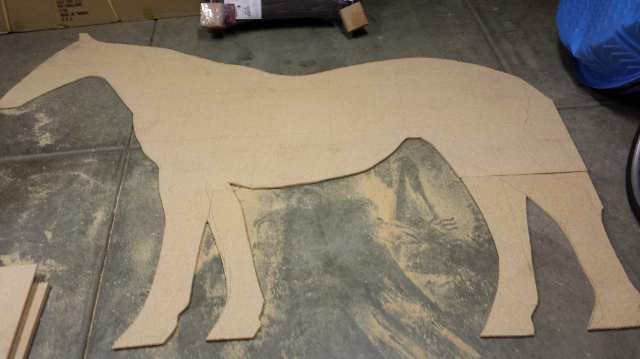 Or at least, a wooden silhouette of a standing horse. 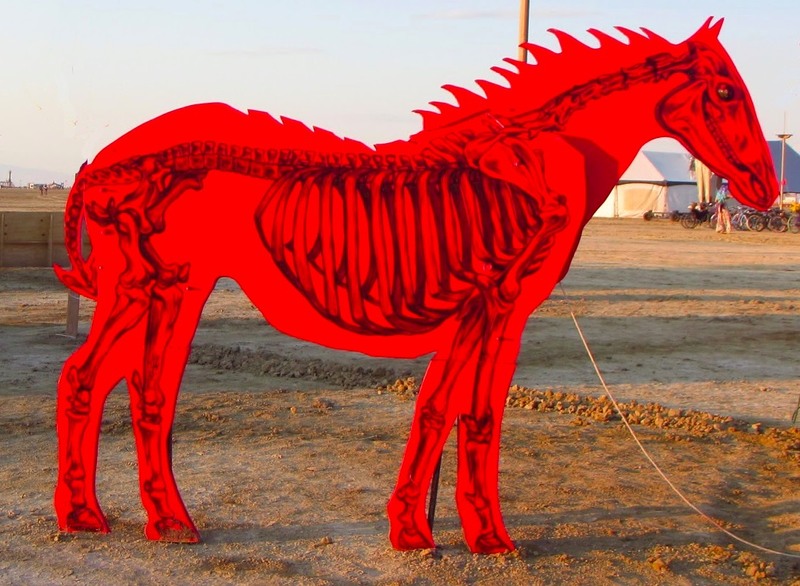 I started by looking for a side-view of a horse that would be a good canonical representation. 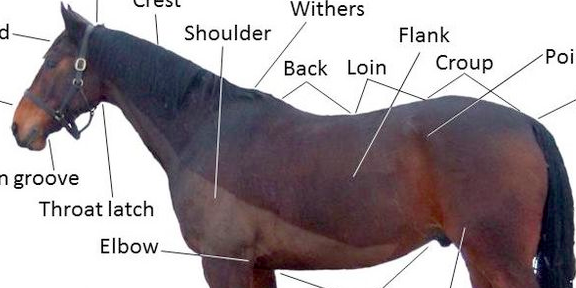 I decided to use the Points of a Horse diagram from the Wikipedia page for Horse. Top of horse, cropped and scaled to fit onto a rectangle 4' high and 8' long. I overlaid a grid on the image, drew a corresponding grid on a 4x8 sheet of particle board, and roughly traced the outlines in each grid cell by hand. Then I cut out the outline with a jigsaw. I was able to cut the legs from the leftover scrap that wasn't used for the body. Particle board wasn't strong enough to hold up to wear, so I ultimately recut the silhouette from 1/2" plywood. This looked ok, and there was time to spare, so I was asked to improve the horse from a motionless prop into an interactive piece that would move when visitors pulled on a rope. I cut out a second plywood body silhouette and one head-and-shoulders-only silhouette. Through trial and error, I found an axis about which I could rotate the head-and-shoulders piece relative to the body to produce a somewhat natural drinking motion (a real horse would articulate at multiple vertebral joints, but the goal here was to find an approximation without undue mechanical complexity). I sandwiched the head-and-shoulders piece between the two body layers, with a carriage bolt as the pivot. The major challenge at this point was that head-and-shoulders piece was nowhere close to evenly weighted around the pivot, and would naturally tend to stay in the head-down position. We wanted the horse's default pose to be head upright, so I needed some sort of counterweight or spring system to counterbalance the head. There also wasn't much room between the two outer layers of the horse to conceal this mechanism. After several unsuccessful attempts at hiding a pulley and counterweight system, I used a latex tube (sold as an exercise band) as a makeshift spring. To add some more whimsy to the movement, I also added a moving tail. The tail was connected to the head by a string with slack in it, so that only as the head approached the end of its range of motion would the string come under tension and flick up the tail. Benevolent dictator wanted the final aesthetic to be less Mr. Ed and more alien demon beast, so I retrofitted a spiky, dragon-inspired mane and devil's tail. Finally, Stroker applied a strikingly out-of-this-world and superbly detailed psychedelic dragon paint job to complete the look. Here is the final result in its natural habitat. Note the rope rising from the shoulders to the pulley; visitors pull the free end to drive the horse's motion. The latex tube used to counterbalance the head lost much of its tension in the desert heat. 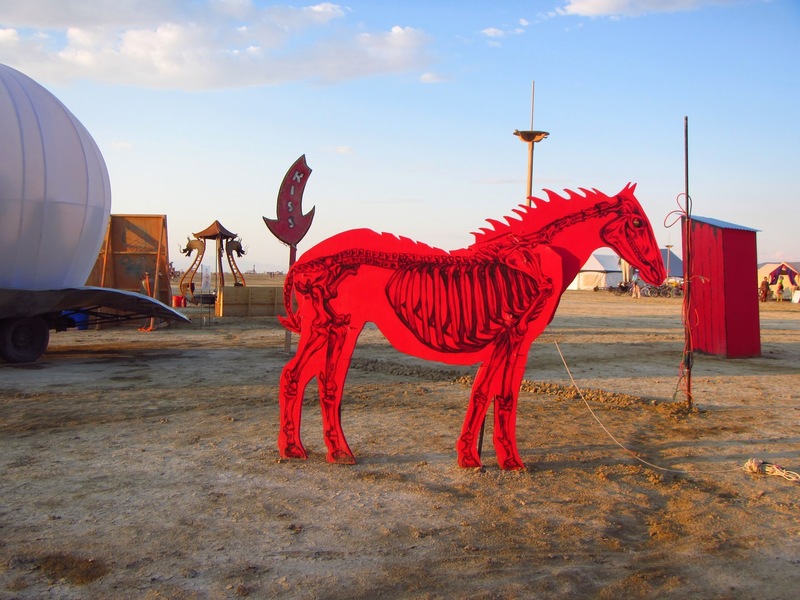 This led the horse to sag out of its upright pose over the course of the first few days.